﻿ Benefits of Hurricanes, Floods, Tornados, Earthquakes and Similar Phenomena of Nature. Benefits? What “benefits?” Rather, terrible losses! Lessons to be gleaned. Le puede interesar: Church of Christ. Peace Publishers. Index W of moral, spiritual, Bible and religious materials in various formats. Le puede interesar: Peace Publishers. Index H of moral, spiritual, Bible and religion materials in various formats. Este tema en español. This subject in Spanish. They EDUCATE many, many human beings in various ways. At least, it is to be supposed this benefit should figure among those resulting from destructive blows of nature. They educate to not build living quarters very close to beaches exposed to hurricanes [cyclones, in the Pacific], tidal waves, tsunamis, nor’easters, etc. Nor on the banks of arroyos, brooks, cascading streams or rivers, regardless of size, that dangerously overflow their beds, courses or nearby areas, often, or even every two, five, ten or thirty years. Nor too close to ponds, lakes or dams whose waters may rise and flood. Nor on lowlands prone to flooding. Neither on, or very near, tectonic faults. Nor on the sides of volcanos. Nor on those of steep mountains where landslides or avalanches of rock, loose gravel or snow may occur. Neither in any other obviously dangerous place. Either that, or use materials and techniques that result in the construction of structures that withstand dangers, whatever may be those threatening the particular place under consideration. For example, sink columns of concrete, steel or wood, strong poles or tree trunks, deep enough to hold, and high enough so that the structure built on them will be above maximum flood water, high tides or storm surges. Another example. In the lands along the great Mississippi River, savvy farmers who cultivate the wide fields of flat, alluvial soil deposited over millenniums by the river, build up elevated terraces of earth on which to construct their houses and other essential structures. High enough to be above the muddy flood waters, which can cover great expanses when the wide Mississippi overflows, as it does on occasion, sometimes with catastrophic consequences. Many poor people of the world, having less resources and possibilities of acquiring a secure living place, suffer very painful losses of possessions and lives when they build where they should not. It would also behoove them to intelligently observe the results of nature’s lashings in the place where they think to build, seek information, accept orientation and take warnings seriously. Proceeding thus, they would save themselves infinite suffering and lamentations. “Poor,” it goes without saying, is not synonymous with “lack of common sense or intelligence.” Not build, then, for example, very close to the areas they plant, on fertile, but flood-prone land. Rather on higher, drier ground, although this should mean they would have to walk a fair distance to get to their crops. Wiser to walk a little, even a lot, than to lose one’s life, and perhaps the lives of family members and/or helpers, because of flash flooding! The fury of the elements teaches us these lessons, if, indeed, we are open to being taught. “Everywhere and in all things I have learned…,” says the apostle Paul (Philippians 4:12). Do we so learn, letting everything teach us? “Nature” and “Common Sense” are very effective and sensible teachers. Woe to anyone who pays them no mind, even making fun of them! The Master Teacher uses “Nature” and “Common Sense” to bring teachings in line with the subjects under consideration. Some examples follow. Prudent men and women build on a rock-solid foundation; the foolish, on the sand or earth, without foundation. “Whoever comes to Me, and hears My sayings and does them, I will show you whom he is like: He is like a man building a house, who dug deep and laid the foundation on the rock. And when the flood arose, the stream beat vehemently against that house, and could not shake it, for it was founded on the rock. But he who heard and did nothing is like a man who built a house on the earth without a foundation, against which the stream beat vehemently; and immediately it fell. And the ruin of that house was great” (Luke 6:47-49). There we have it in a few words! Why does it cost us so much work, suffering and loss to understand and practice it? From the humblest and poorest to the most capable, proud and rich, we are often hard headed, blind-sided, obtuse, impractical or just plain slow. And that, I greatly fear, is also true in the realms of soul and spirit, truth and error, right and wrong, salvation and perdition. This matter of building on the sand, without a secure foundation, is applicable not only to earthly things and physical life but also to marriage, home and spiritual life, these being infinitely more important than the earthly. Marriages built on the sands of purely sensual pleasure. Homes, households, families constructed beside or over arroyos or streams of dirty, contaminated waters where flash flooding is common. Angry, impetuous, frothing waters full of contaminants, that sweep away everything and everyone caught up in them -married couples, consensual couples, their offspring, big and little, legitimate or illegitimate- bruising and mauling them, even drowning them. All along their precipitous descent to the nether regions, throwing up their seething foam of excesses, vanities, foolishness and shame. More secure and wise it would be to build on the “rock” of the teachings of God and Jesus Christ! When prudent men and women build, they use long-lasting materials; the foolish use weak, fragile materials that do not last very long and are easily destroyed. “For no other foundation can anyone lay than that which is laid, which is Jesus Christ. Now if anyone builds on this foundation with gold, silver, precious stones, wood, hay, straw, each one’s work will become clear; for the Day will declare it, because it will be revealed by fire; and the fire will test each one’s work, of what sort it is. If anyone’s work which he has built on it endures, he will receive a reward” (1 Corinthians 3:11-14). to save themselves from waters that continue to rise. 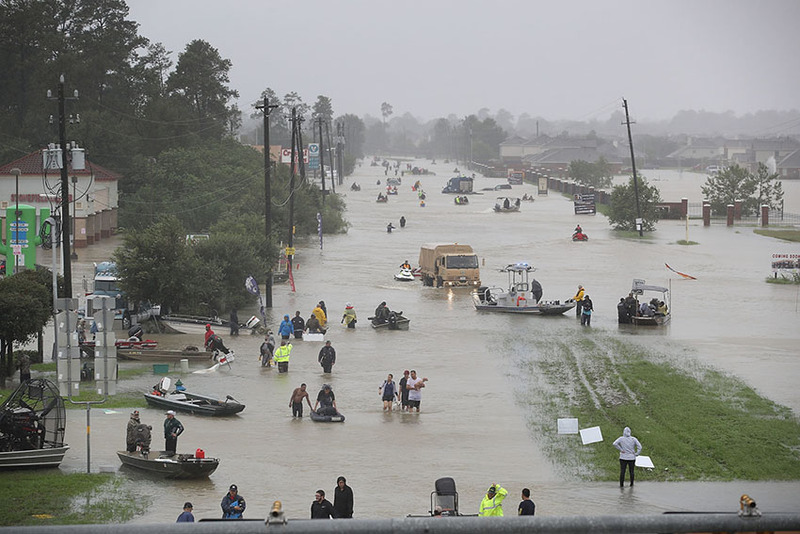 Hurricane Harvey (August, 2017), with its negative sheet of scores of deaths and enormous material losses: Was it a punishment for Texas in general and Houston in particular because of their votes in the 2016 elections? Some politicians occupying important positions, and entertainers or actors and actresses, whatever they occupy, assure us it was just that. Or, the other side of the coin: Was Harvey a punishment because Houston elected a lesbian as mayor, a very aggressive lesbian who defended her life style and special rights for transsexuals, etc., keeping her in power for a number of years? Personally, at this high time of my life and of my scrutiny of such subjects, I understand that just as God the “Father in heaven…makes his sun rise on the evil and on the good, and sends rain on the just and on the unjust” (Matthew 5:45), so he does also permit hurricanes, floods, tornados, etc., to impact the good as well as the evil, the just as well as the unjust. As a warning for the evil and unjust, and a trial for the good and the just. Punishments for all? Yes, very definitely. Punishment in general for all of creation -fauna and flora, humans and animals, the live and the inert -a consequence of the curse pronounced because of the decision by humans to not honor their loving and benevolent Creator and refusal to conduct themselves in harmony with his “good will, agreeable and perfect” (Romans 12:2). With this reservation: That when certain cities, places, peoples or nations become corrupt and rebellious to very great extremes, the possibility that God the Creator will bring punishments on them in proportion to the very high sum of their evils should be taken quite seriously. I have in mind the cases of Sodom, Gomorrah, other cities of the Jordan plains and first century Jerusalem. After the tempest, the sun comes out! After the Great Flood, the rainbow! The hurricane lasts for two or three days. Then, blue skies, white clouds, the sun, the moon and the stars take control during many days, weeks, months, interrupted now and then when heavier clouds bring rains vital for the earth and its inhabitants. Instead of roaring winds hour after hour, soft breezes that refresh and delight. Calm and rest follow the tumultuous, fearful and exhausting. How absolutely marvelous! The volcano erupts with a tremendous, devastating explosion, then remains inactive during years, decades, centuries. The earthquake shakes mountains, valleys, plains, deserts, cities, towns, structures and people with a terrifying force, for the space of a few seconds, followed by maybe two, three or several aftershocks. Then, time goes by, perhaps much time, before the tectonic plates move against each other again, causing another quake, maybe in the same place, maybe farther up or down. Between nature’s destructive events, time, in some instances, much time for the earth and its dwellers to revive and recuperate; to repair, reflect, learn and improve construction! If it were not thus, how to survive, arise and continue? If natural disasters should occur very frequently, chaos would set in, worsen, and our race might soon come to an end, I think. This is not taking place, and I see God’s benevolence and wisdom in the timing of intervals between climatological events, seismic ones, etc. What do you see? After sickness, healing and health! With exceptions. After old age and death, resurrection to life eternal, with a glorious, incorruptible spiritual body! I should add: For the just and obedient to the divine will, and not for those who do not love the truth, nor fervently desire glory, honor and immortality (Romans 2:6-11). After some, or many, evil days on earth, an eternity without them in the new earth, with new heavens, God’s Paradise! After running for a time -a year, a few years, or many- in the darkness of dissipation, of vices, even crime, come to a full stop. Come to your senses. Change your attitudes, conduct and goal, turn and walk in light for the rest of days, doing good. “For we have spent enough of our past lifetime in doing the will of the Gentiles—when we walked in lewdness, lusts, drunkenness, revelries, drinking parties, and abominable idolatries. In regard to these, they think it strange that you do not run with them in the same flood of dissipation, speaking evil of you. They will give an account to Him who is ready to judge the living and the dead” (1 Peter 4:3-5). In not a few situations, the most sensible thing to do is get up and flee as fast as you can from the approaching violent phenomena of nature. And, it is even wiser to get up and flee from temptations when they come up, perhaps unexpectedly, before you with powerful, menacing force. Flee from the very appearance or “form of evil” (1 Thessalonians 5:22). Flee and resist! To stay in harm’s way, whether material or spiritual, is to expose yourself to destruction, whether material, spiritual or both. “Resist the devil and he will flee from you. Draw near to God and He will draw near to you” (James 4:7-8). As large areas of solid earth cause hurricanes to weaken, even to the point of breaking apart and dying out, so also de solid, massive TRUTHS weaken, even demolish, perhaps quickly, maybe slowly, the ferocious winds and torrential rains of misinformation, falsehoods, lies, deceits, unsubstantiated theses, empty or venomous philosophies, vain traditions and ignorance in general. These evils, and more, in the sciences of material, secular knowledge, as well as in the realms of moral, religious and spiritual knowledge, domains of the mind, soul and spirit. The high and immovable mountains, for example, of Puerto Rico, the Dominican Republic and Cuba, constitute serious impediments that can detain or alter the courses of tropical storms and hurricanes in their destructives paths across seas and lands. Correlatively, the very elevated and immovable celestial truths have a similar effect on the tempests of evil born in hell that assault individual minds, brainwashed groups of unthinking minds (for example, college students with melded minds, practically incapable of individual, objective, logical analysis), cultures, societies, races and whole nations. They weaken them. They disperse them. They can break them up completely. Bringing calmness, peace, restfulness, light and hope, and these benefits and blessings do not defraud, do not vanish away, as long as we wish to preserve them. While some curse the destructive phenomena of nature and others use them as an excuse to get even drunker, vandalize or rob, there are some who come to a stop in their frenetic rushing through life to reflect on the fragility of material things and of life itself on earth. The more serious among them, acquiring more understanding and intelligence regarding the origin, purpose and destinies of humans, determine to change the course of their life. They feel anxious for something better, more reliable, more lasting. And, they proceed to search for the very excellent truths that fortify and protect the soul and spirit, no longer primordially concerned with what might happen to the mortal body impacted by destructive natural forces, sicknesses, physical deterioration and old age. Not even with its inevitable death! In other words, these natural phenomena of a menacing, violent kind cause them to come to a fork in the road of life, which calls for a supremely important decision. The fork in the road presents three options. Turn around and walk back, repeating the same errors, committing the same sins and suffering the same, or worse, consequences. Take the way to the left, cursing, blaspheming, becoming angrier and angrier, frustrated, more and more confused, losing all faith, losing control, falling into depression, dementia, and coming to a cold, empty, very unhappy end. Or, take the way to the right in search of the truth, light, God, exploring spiritual dimensions, until you yearn to belong in them, obtaining their very rich blessings for mind, soul and spirit, the which also redound in great blessings for the mortal body and earthly life. It is to be supposed that the person who takes the way to the right would come to understand that the destruction caused by hurricanes, floods, tornados, earthquakes, etc., is just one of the faces of these phenomena. Of course, God permits them to occur! Why, Lord? Why? Not just to arbitrarily destroy earthly properties and lives, but to provoke the vice-ridden, depraved, rebellious, superstitious and idolaters to REPENTANCE. Behold, we see here another face of these phenomena. When humans, in whatever place or time they find themselves, turn corrupt to the highest degree, rebellious to God and good, contumacious and blasphemous, God just might bring deadly plagues on them. Would he do it out of pure perversity? Arbitrarily? Absolutely not! Not the God I see in the Bible. He would do it to persuade them to repent. During the time of the Sixth Trumpet of Revelation, God unleashes three terrific plagues on very corrupt, very stubborn humans, to move them to repentance. But, they “…did not repent of the works of their hands, that they should not worship demons, and idols of gold, silver, brass, stone, and wood, which can neither see nor hear nor walk. And they did not repent of their murders or their sorceries or their sexual immorality or their thefts.” (Revelation 9:13-21). Lamentably, this is the very same irrational reaction of many people today to blows of nature. They do not reflect. They do not learn. They do not repent. They do not change. On the contrary, they blaspheme “the name of God who has power over” the powers of nature, and do “not repent and give him glory.” (Revelation 16:9). 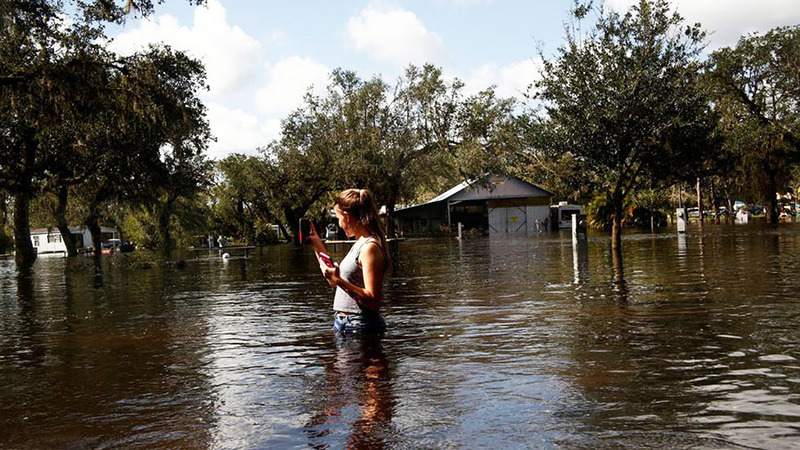 The hurricanes and tornados go on past and play out, the flood waters recede, the earth stops shaking… and they go back to their vices, their cheap way of life, the mud of their uncleanness, wallowing in it with gusto! Is there a remedy for such humans? Any hope for them? Studying the mind and the actions of God the Creator, we see, and can understand if we want to, that when there is no “remedy,” he will proceed resolutely against the recalcitrant unrepentant. “And the Lord God of their fathers sent warnings to them by His messengers, rising up early and sending them, because He had compassion on His people and on His dwelling place. But they mocked the messengers of God, despised His words, and scoffed at His prophets, until the wrath of the Lord arose against His people, till there was no remedy” (2 Chronicles 36:15-16). Reference is to the people of Israel, in the time of the prophet Jeremiah and the evil king Zedekiah. Did you take note? God is not so capricious and irate as many conceive him to be, or, in their ignorance of him, allege him to be. Quite to the contrary: He rises up early and sends warnings by his messengers to those who shun and disobey him because he has “compassion.” Do you see that in the above text of 2 Chronicles? He punishes severely only when there is “NO REMEDY.” So then, repentance instead of mocking, despising and scoffing! Another face of these phenomena of nature is the opportunities they bring for doing many and great good works, thus demonstrating true love and compassion for suffering fellow mankind, without any regard whatsoever to race, color, social status, political conviction, etc. Sacrificing resources and time in favor of victims. Even risking one’s own life to save the lives of human beings in danger of losing theirs. Incredible, massive manifestations of material help and moral support. True reflections of the love and compassion God the Creator has for all mankind. So much so that even the principal purpose of his punishments is to get his spiritual progeny -the spirit of every human is engendered by God the Father (Hebrews 12:9)- to be reconciled with him and return to the bosom of the “family of God” (Hebrews 12:1-11; Ephesians 2:19-22). And still another face of these phenomena is how they serve to order priorities and put matters of this life in more sensible perspective. Conversations and controversies about vain, mostly empty, infantile subjects, virtually cease, albeit temporarily. Gossip, foolish, childless obsessions with personalities of Hollywood, Bollywood, movies, television, theater, the music world, the sports world, Facebook, Twitter, etc., diminish some, at least a little. Real and urgent needs of the affected population are brought forward to Page One. The restoration of what has been lost. Removal to a safe place of what can be salvaged. Improvement of organizations, material resources and infrastructures to avoid repetition of the disaster. And, among the more thoughtful, perceptive, perspicacious and spiritually sensitive, on the Front Page are to be found: The significance of these events, their place and purpose in the designs of the Creator God for humanity and the universe, lessons for one’s own self, lessons for the human race in general and how to communicate them to hearts willing to receive them. “Prepare opportunely for the worst!” For phenomena more or less predictable, such as hurricanes, severe thunderstorms or weather fronts, tornados, flooding and earthquakes. Having been warned in time of possible impending disasters, with what logic would we pay no attention to the warning, or not prepare adequately, on time, for them? The application of these norms to different aspects of life is quickly seen by the soul sensitive to the reasonable and spiritual. Especially, in the matter of the soul’s destiny. In this regard, God the Creator, desiring to save all spiritual beings he has engendered- remember: he is the “Father” of our “spirits”- has provided very clear warnings and a way to escape danger, advising us beforehand, that he “has appointed a day on which He will judge the world in righteousness by the Man whom He has ordained. He has given assurance of this to all by raising Him from the dead” (Acts 17:31). So then, prepare in time and for the worst! Benefits brought about by nature’s destructive impacts? We can definitely discern some. If there were not any at all, such events would have to be considered totally negative. God the Creator has promised us a NEW WORLD, “the world to come” (Hebrews 2:5), free of hurricanes, storms, floods, lightening, hail, earthquakes, tsunamis, volcanos, etc. It is mine, if I truly want to inhabit it. And, yours! Provided you qualify to live there. What do you say? If you want to, we gladly offer you our help, without obligation or cost, now or later. Only orientations regarding how and where to take the steps, already stated, of confessing Christ as Lord and Savior and being buried (immersed) in water that your sins may be washed away.